Hybrid-Thermic Heat Technology is a Heat Surge exclusive - The Hybrid-Thermic Heat Technology stems from an internal mini furnace that generates a revolutionary thermic heat. This safely heats both you and the air around you, all without any hot or cold spots. Saves you money with lower heating bill by using Zone Heating. 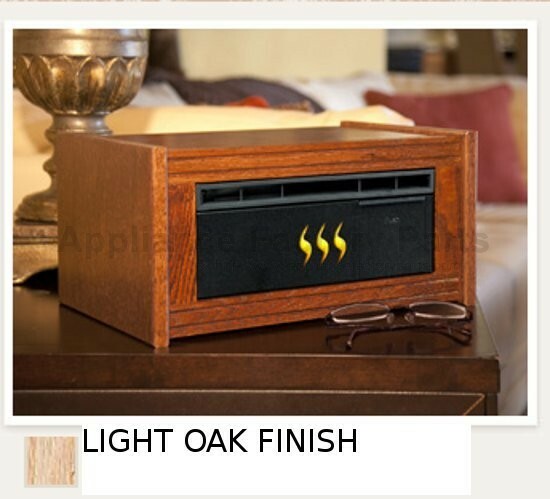 The Patented Heat Surge Cool Touch Opti-Flow Vent technology keeps your heater cool to the touch. Insuring that both you and the air around you are warm and the heater is not. Come fully assembled, all you need to do is just plug it in and start enjoying the bone-soothing heat. Safe to operate with a 6-foot cord with 3 prong grounded plug. This unit is also UL approved for USA and Canada. The Amish mantle is made with real American wood by authentic Amish Craftsmen in the heartland of Ohio. No particleboard or MDF (fake wood materials) are used in this product. Heating produces an astounding 4,606 British Thermal Units (BTU?s) or 1,500 watts on the High setting. On the Standard/ Low setting it produces 2,303 British Thermal Units (BTU?s) or 750 watts. We're adding new HS-30000496 parts all the time, contact us for pricing and availability.